Running has long been considered to be the most effective fat-burning exercises, and at the same time, it is an excellent cardio exercise, and stimulates the heart to pump more blood. Yet, running has one disadvantage, as it represents a high-impact exercise which applies too much pressure on the feet, thighs and knees. Moreover, running burns 10 calories a minute, so it can easily be substituted with other exercises which may burn even more calories. However, note that you should choose exercises that target different body areas, in order to tone different body muscles. It is of high importance that you leave some time for the muscles to recover as well. 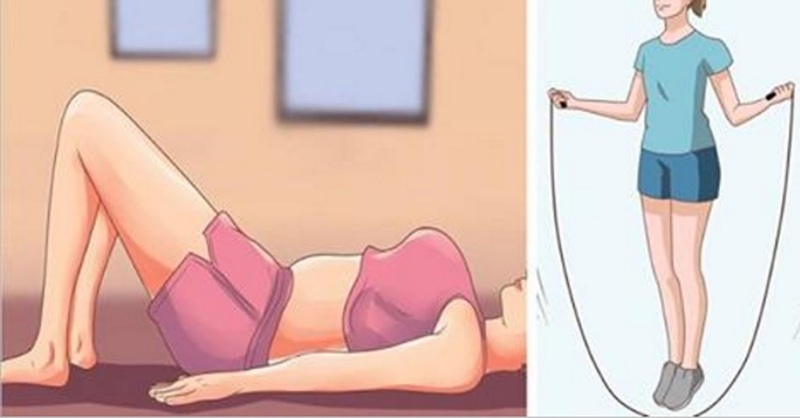 The following 10 exercises can be as effective as running, and they will help you burn excess fat and keep your body in a perfect condition. Burpees are even more effective than all-out bike sprint, so 10 burpees a minute help you 14 calories. This exercise will help you burn fat and improve your metabolism. This exercise takes only a few minutes, but it helps you burn 10 calories a minute. It can be done by everyone, so you should incorporate it in your exercising regime. This is a rather difficult exercise, as you cannot easily control the large tires of the bicycle. You can burn around 1,500 calories per hour or 25 calories per minute, and you will avoid the strain imposed on the knees, but your effects will be doubled. Jumping rope can be a fun and effective medium-intensity exercise. You can burn up to 13 calories a minute if you manage to do up to 100 skips per minute. Moreover, this is a complete exercise. A recent study found that the battle rope exercise is the best one for total oxygen consumption, compared to numerous other exercise types. Jump squats are one f the most effective exercises you can do, as they can provide amazing effects. These can help you burn 14 calories in 20 seconds hard work. Intense indoor rowing can actually burn 375 calories per half an hour. This exercise will tone and tighten the muscles in the shoulders and arms. This exercise is extremely efficient, and it is far more effective than running, since you move at the same speed when skiing, but the burnt calories per minute are more.